Hamburg – Every second counts in an emergency. There is no room for error, especially when the patient needs assistance with breathing. Because great demands are made of Emergency Medical Services in such situations, WEINMANN Emergency has developed MEDUMAT Standard2 , the ideal partner for pre-hospital care. MEDUMAT Standard2 offers a completely new view of modern ventilation. The large color display shows all major respiratory parameters with optional ventilation curves. The familiar color coding, e.g., for patient selection, makes intuitive operation possible. Clearly organized operating elements and symbols, plus effective acoustic and visual alarms are additional details that ensure the highest level of safety. MEDUMAT Standard2 also offers clearly better perspectives on flexible use. Compared to the previous model, the new ventilator has many more functions. Another new feature is the option of a robust flow measurement taken close to the patient and accompanied by the display of MVe, Vte, f, fsp, Vleak. Sidestream capnography is available as an option for ideal ventilation monitoring. Besides the ventilation mode IPPV, MEDUMAT Standard2 is equipped with CPR (for Cardio Pulmonary Resuscitation), RSI (for assistance with induction of anesthesia) and CPAP + ASB (for Non Invasive Ventilation). Pressure-controlled modes such as PCV, aPCV, BiLevel + ASB and PRVC + ASB also can be activated as options. 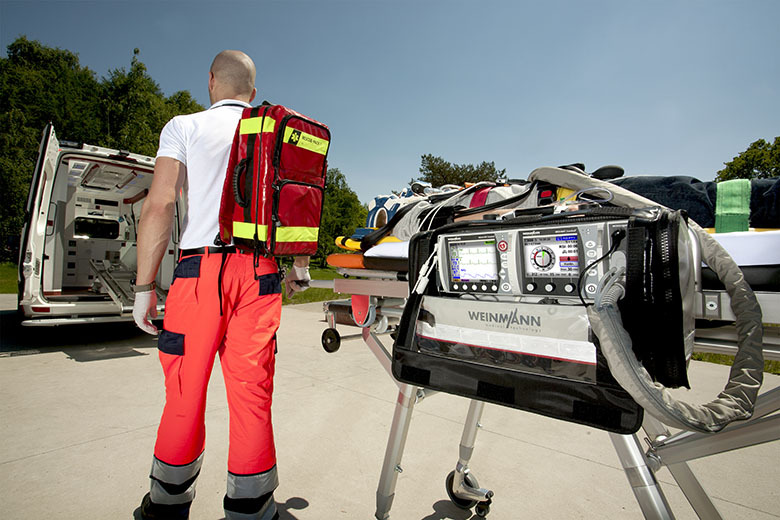 For pre-hospital care, emergency room treatment or secondary transport, WEINMANN Emergency offers you a reliable partner in the MEDUMAT Standard2 . Emergency medical personnel who save lives, transport intensive care patients and help at the scenes of disaster know and trust WEINMANN Emergency. For more than 140 years we have offered our customers the greatest degree of reliability, quality and experience. Our products repeatedly set new standards in emergency medicine. From emergency medical cases and suction solutions to ventilators and defibrillator/monitoring systems, WEINMANN Emergency offers the right solution to satisfy every need. Our devices meet the toughest demands under extreme conditions in certified high quality. Our ventilators and defibrillators are suitable for use at emergency sites, in the hospital and during intensive care transport via water, ground or air. Because our products are so robust and stable, armies and disaster control units around the world have relied on WEINMANN Emergency for many decades. We maintain a presence in more than 100 countries with branch offices, contacts and a close network of partners. The professional users in emergency medicine give us valuable input for our product development. We work in close contact with users from emergency medical services, hospitals and armies, comparing notes and exchanging information. Moreover, many of our employees have gained personal experience in emergency medical services or hospitals. Time after time our innovations start new trends and bring about fundamental improvements in emergency medical work. Our MEDUMAT has become legendary as it has set new standards for emergency ventilators. In addition to their reliable technical functionality, our new devices have to fulfill three other criteria. Firstly, they must always be ready for immediate use; secondly, they have to be easy to operate; and thirdly, they have to lighten the users’ workload. That’s why ventilators and defibrillators from WEINMANN Emergency can be operational within seconds, intuitively managed and handled so easily that users can concentrate completely on the task at hand, that is, the rescue and care of emergency patients.